Summer is ending and before you know it, the leaves will burst into fiery colors. 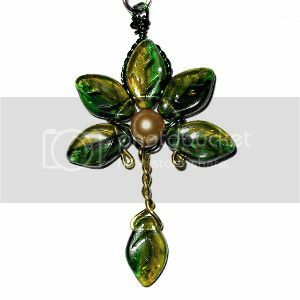 Even after they fall and crinkle away, my new leaf necklace will remain gloriously green as a welcome reminder of warmer seasons. A balmy breeze carried the Evenstar pendant all the way from Shealynn's Faerie Shoppe. Very nice pendant! Great find!